"Have action cam, will travel." That's probably what was going through your mind as you pecked your credit card details in when buying your first GoPro, Drift, Sony or what have you. We promise, it won't be long before you're looking to kit it out with some accessories. In fact, more than any other gadget, the humble action cam craves to be accessorized and adapted for a seemingly unlimited number of applications. It's lucky then, that there's a truckload to choose from. If you're thinking it's all just poles and helmet mounts, you're in for a surprise (though that's definitely a good place to start). We've rounded up a bunch of the best that should cover everyone from the weekend warrior to pro film crews. This is your action camera, upgraded. (Psst: Check the galleries for more info on each product). Let's start with the elephant in the room: Many of the coolest accessories are made for GoPro cameras, and they have a proprietary connector. So, the first thing you'll want if you have a different brand of camera is an adapter like this one, available in stores, or on eBay for a few dollars. Conversely, if you have a GoPro, pick up the tripod mount, and hey presto, (nearly) all the accessories work on all the cameras. 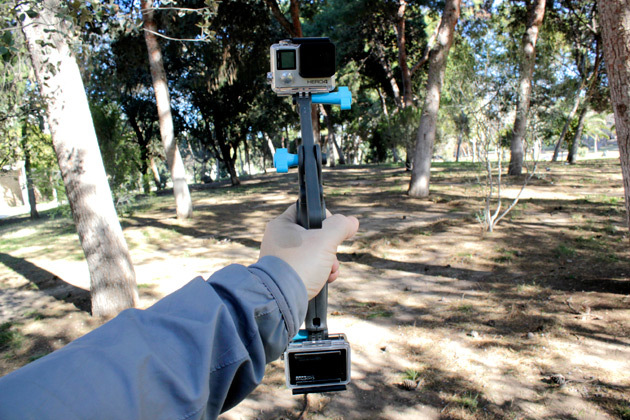 As I suggested in the introduction, the second basic item is a monopod. Or, if I must use the word, a "selfie stick." Unlike the cheap-looking ones people insist on using with phones, your action camera will need something a little more robust. For GoPros, I highly recommend the company's own "3-Way" ($70). It articulates into a number of positions, and comes with a mini tripod inside the handle. It can also serve as a regular handgrip. 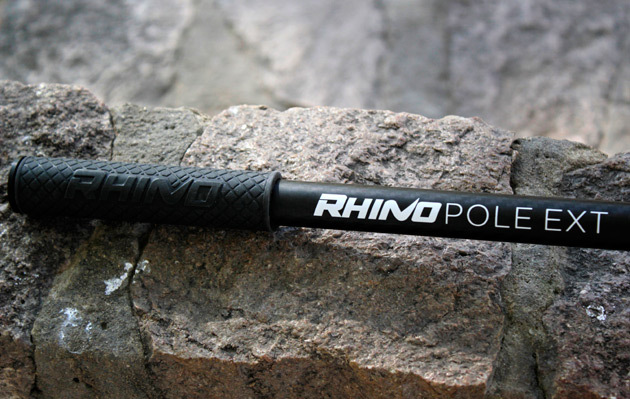 If you just want a simple, durable stick, the Rhino Pole ($30) is one of our favorites. Made from carbon fiber, this 20-inch pole is light and strong. For an extra $20, you can get the extending "EXT" version, which lets you get a wider shot (i.e., more of the scenery), or reach places a shorter pole cannot. Both versions have a regular tripod (1/4-20) connection in the base of the handle, which means you can attach it to other accessories for even more creative options. If you plan on using your action camera all day (or at least would like to), consider the PowerPole from Polar Pro ($100). The aluminum pole is extendable between 17 and 30 inches, and at 13 ounces, it's built like a tank. That's not the talking point, though; as the name suggests, the PowerPole has a 5,200mAh battery inside, and two USB ports near the tip. With this pole, you can charge your camera as you use it, for an additional 10 hours use, according to the company. For my part, I never did fully exhaust it; let's put it that way. If your activity needs the camera in waterproof housing, you won't be able to charge while you film (you can still use the pole, as the USB ports have rubber plug/covers to protect them), but you've still got a great monopod with a battery you can use between takes. If you prefer to be behind the camera, Polar Pro has something for you, too -- a phone case with a GoPro connector ($30 -- available for iPhone 5/6 and Galaxy S5). At first, this might seem a little odd, but it makes a lot of sense. The case turns your phone into a rudimentary grip mount, but it makes even more sense when you use it with your camera's companion app. Now, you've got a grip that doubles as a real-time viewfinder. Great for easy access to camera settings, too, and no need to spend out on a dedicated LCD screen accessory. Simple. We can't explore everything here (there really are some niche accessories), but there are some mounts that lend themselves to a wide variety of uses. The Capture POV by Peak Design ($70) is one example. The belt clip mounts a camera on anything you can fit between its jaws (most likely belts or backpack straps). In many ways, it's like a more-versatile "Chesty" mount. The metal finish gives it a high-quality, rugged feel, and an adjustable pin lets you pivot the camera on one axis. There's a quick-release button, too, if you need to pop the camera out to change settings on the go, or take a shot from a different angle. Water sports deserve a special mention, given that waterproofing is a key selling point for many action camera owners. One of our favorites is Octomask ($80). 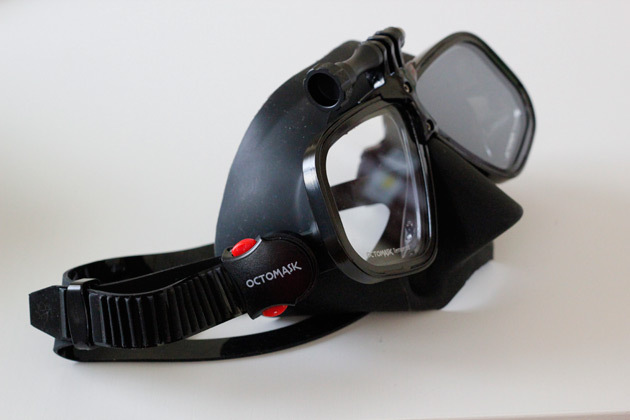 The idea is simple: Make a diving mask, and add a GoPro mount for instant hands-free POV filming. The silicone skirt on the goggles is soft -- great for comfort -- and the choice of three goggle styles means there's one for your preference. The tempered-glass lenses are strong and won't scratch up like a cheap seaside pair -- you can even get prescription lenses in them if you want. If you're really brave, you could wear these for POV video on dry land, too. No judgment here. If you've been adding the above items to your cart as you go, you're going to need to keep everything organized, and that means a case. There are many, but we found SP Gadgets' POV Case (starting at about $20) to be a good choice for the budding accessory collection. It's available in three sizes, with the largest one ($50) having enough space for two cameras plus batteries, remote controls, grips, cables and more. We also like that it's available in (almost, if you squint) Engadget blue. Once you've got the basics covered, you can get a little funkier. Some action cameras, like Garmin's VIRB, include data about your activity (speed, location, that kind of thing) you can overlay on your video. If yours doesn't, no worries: A little upgrade can help. Blast Motion ($149) makes a small sensor that sticks to the back of your cam, and records acceleration, vertical height, rotation and hang time -- auto detecting key events in your video as it goes. You can later overlay this info on your videos for, let's be honest, bragging rights. It's a little pricey if you're just into showing off, but if you're serious about your sport, the added data could be useful when reviewing performance videos. If your dilemma is more about choosing between your point of view and, well, filming how cool you look doing whatever you're doing, there's an answer for that, too: the Flex Grip ($50) from UK Pro. It's a handle grip with GoPro mounts on the top and bottom so you can have cameras facing forward and backward at the same time (or, both in the same direction). The top section is extendable and articulated so you can shoot from a variety of angles. You can also mount a light instead of the second camera if you're less vain, or (obviously) filming in the dark. Speaking of lights, SP Gadgets' POV Light ($99) has GoPro mounts on the top and bottom, so it can slip in between your camera and favorite mount. It also houses two batteries that are GoPro Hero 3/3+ compatible, meaning you either get some spares in the bargain, or can re-use any from your old camera if you moved on to the Hero 4 (it can also charge both at the same time, which is another added perk). Sometimes, you want to film from the same spot, but track a moving target (or add motion to time lapses). For this, there's Galileo from Motrr ($180 with GoPro adapter). The small, motorized dock has been spinning phones around for a while, but it recently got a long overdue mount for GoPro cameras. By using your action camera, it frees your phone up so you can control Galileo's motion over Bluetooth wirelessly, through an ever-growing library of compatible apps. If you're craving panoramas, video globes, and other motion-perfect footage, this is a godsend. If you want the reverse situation (for the camera to revolve around you), then look for the Rhino 360 Swivel Mount ($150). It's basically two Rhino poles (that we already mentioned) screwed into a rotating bracket, so you're getting two selfie sticks thrown into the deal (or, if you have two already, you just need the bracket). One pole has a counterweight, while the other holds your camera. You'll almost certainly feel self-conscious wearing it, but the effect it creates is pretty sweet (see above). Mounted correctly, it gives a smooth, rotating third-person perspective that will baffle those who don't know the secret. What if you want a literal third-person view? There is, as they (don't really) say, a mount for that. It's conveniently called the... 3rdPersonView (€115 and up). It's comprised of a thick belt (like a weight lifter's) and an extendable pole that slots in the back. The pole can be set in the belt at a number of angles (like a hand on a clock face), and the angled section makes it easier to set the camera directly on you. The result is just as if someone were filming above and behind you (or see below). Along with the swivel mount, this is one of the most fun ways to wear your action camera, and another one that will leave people guessing how you got the shot. By this point, you probably need a bigger, more robust place to store your growing collection of accessories. Plus, you want to look the part, too, right? UK Pro comes to the rescue (again) with its POV hard-shell, waterproof cases. The POV40 or 60 ($100/$150) will securely stash away your cameras, with plenty of space for batteries, housings, clips and more. There's a handy slot for a tablet too. The pre-cut foam is designed for GoPros, but you can easily adapt it for your camera. But, most of all, the cases are relatively lightweight, yet tough as nails. If you've got this far, it means you're pretty serious about your action camera footage. Or, like us, just love a fancy gadget. The accessories that follow will (at least help) elevate your video above the rank and file of most YouTubers, and give it that professional spit and polish. We're no longer looking at poles and cases, but tools to help you get a better quality (rather than type) of shot. When people started adding cameras to drones, it wasn't long before they created "gimbals" for them, to smooth out the camera movement. Some bright spark (in this case, FeiYu Tech) didn't see why drones should have all the fun, and transplanted one of these gimbals onto a hand-held pole. The result? Some of the smoothest GoPro footage you'll ever see shot on the ground. This is, without a doubt, the single best upgrade you can give your camera if you're using a GoPro for general video projects (and ruggedness isn't an issue). At $349, the price isn't negligible (that's almost as much as the camera itself), but the difference it makes is priceless. With your footage ironed out, the next thing you'll want to improve is the sound. There are two microphones we can heartily recommend (one lavalier/lapel mic, the other a shotgun) based on real-world experience. They also come recommended by GoPro's own media team (via its Professional Guide to Filmmaking book). The lav mic is the EMW Omni from Countryman ($229), and ideal for a few reasons. Firstly, it's water-resistant, so it can keep up with your outdoor pursuits. Secondly, its flat-headed design means you won't get rustles and rubbing noise from your clothes -- these can be especially problematic if you're doing something active. Lastly, it's highly configurable to perfectly match the kit you're plugging in to (e.g., which connector it needs) and even the skin tone of the wearer. Most importantly, the audio it grabs is consistently good. Sometimes, you don't know you need something, until you see the difference it makes. Or, in the case of the Shure VP83F shotgun mic ($299), hear the difference. The VP83F is designed for DSLRs, so it has all the features you'd expect for grabbing great audio out in the field: 24-bit/48kHz WAV recording to microSD (as well as direct to your video), a windscreen, a headphone port for live monitoring and excellent, directional sound. The VP83F requires two AA batteries, which adds one more thing to remember in your kitbag, but it's a small price to pay for the audible rewards. Just one pro tip, given the wide angle on action cameras: be careful where you place this, or it'll show up in the shot. Accessories can help solve that mic-placement problem, too. Specifically, the wonderfully named Norbert Sport Junior from K-Tek ($150). 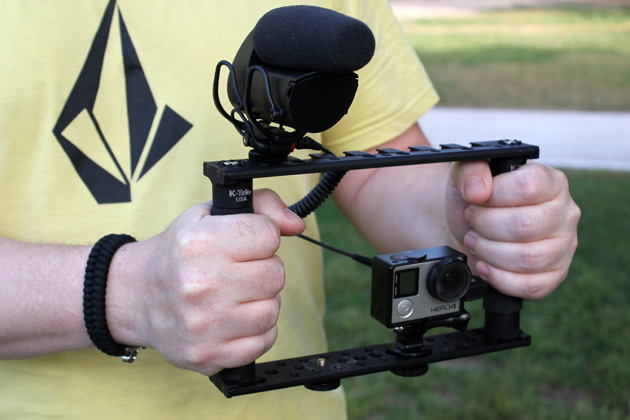 This DSLR-style frame mount isn't just good for propping up your mic; it can also fit two action cameras side by side. Connect it to a mono/tripod, add a light and, well, almost any other accessory you might need (god knows we have plenty by now). The two grips on either side of the Norbert allow for steady handling, and a swathe of tripod screw holes along the top and bottom make this one versatile (and pro-looking) bit of kit -- you can even use it with the FeiYu gimbal we mentioned above, as seen at 1:39 right here. As we reach the end of this list, let's look at something that will appeal to the action camera crew with a very specific need, aka the "one-person film crew." Filming on your own throws up challenges, especially if you want to be in the film you're trying to shoot. Enter Soloshot2 ($399). This ginger "robot" attaches to a tripod, and pairs with a GPS "tag" you either wear, or attach to something moving. The motors in the Soloshot2 track, pan and tilt your camera to keep the tag in frame from as far as 2,000 feet away. The Soloshot isn't specifically designed for action cameras (in fact, it has features to control some camcorders and DSLRs), but given the problem it solves, there's a certain slice of the action-cam crowd that will get just how useful this is. Be sure to check the galleries for pictures and more information on everything featured here.